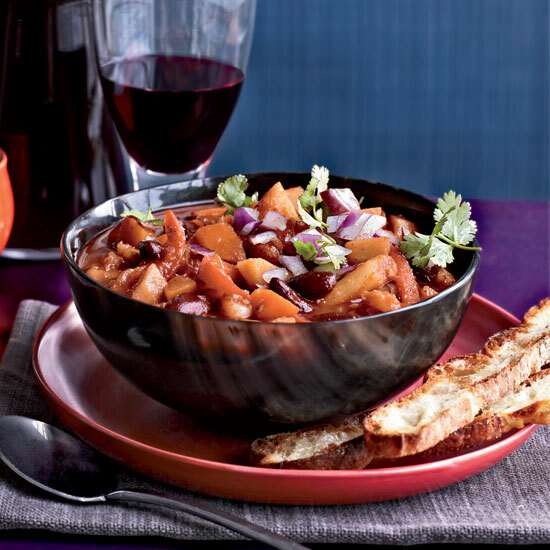 These fantastic chili recipes are just as hearty and delicious as their meaty counterparts. Spicy chili seasonings are fantastic for infusing bland tofu with flavor. Mushrooms pack an umami punch, so they're a great substitute for meat. Tender butternut squash and green lentils star in this easy, one-pot chili. The slow cooker is fantastic for making this chili, which has hominy and shiitake mushrooms. This vegetable-packed chili is deliciously smoky and spicy. Here are two recipes in one: a garlicky rice side dish and a hearty black-bean chili featuring zucchini, squash and bell peppers. It doesn't get any easier than this terrific, fast chili made with canned black-eyed peas. Have a half hour to spare? Former F&W editor Kristin Donnelly's chili is really just spiced black beans, which get a tangy kick from a dash of vinegar.